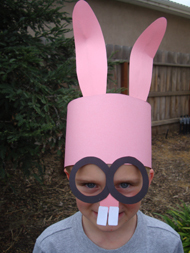 This Funny Bunny Hat is the funnest Easter Bonnet around! This is easy to make with our printable templates and the kids will surely get a kick out of it! 1. Cut out all of the template shapes. Trace and cut out the ears and nose bridge on construction paper (we did ours in pink). Trace and cut out the the glasses on black paper and leave the teeth white! 2. To make the ears bendable we glued on a piece of pipe cleaner from top to bottom, this is optional. 3. Measure around the child's head to make the band. Staple or tape the ends together. 4. Overlap the two black circles in the middle and glue them together. Glue the nose bridge onto the bottom of the glasses (you'll have to measure it against the child to make sure it's not too long or too short and adjust the length). Glue the teeth onto the bottom of the nose bridge. Lastly glue the whole face onto the band by gluing just the top of the glasses to the bottom of the band. 5. Glue the ears onto the top of the band and you're done! Make this even cuter by gluing a cotton ball to the back for the tail!